Here is a table showing just the last 3 secular commodities bulls and associated solar maximums. I have created a forecast along the top row for the current cycle, based on them. I found it help clarify what could come to pass. 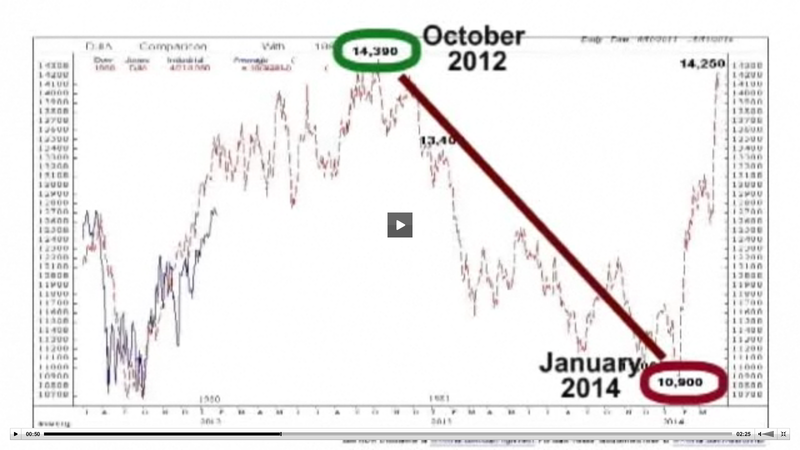 Gold could potentially not peak until late 2013. But peak inflation should occur fairly close to the solar peak, suggesting oil/food, at least, should surge ahead of that, and gold should be performing well by association. Real equities valuations could potentially not bottom for another few years, if a recession begins later or a double recession occurs. It doesn’t alter my strategy or positions. It perhaps implies a little more patience is required in seeing it all play out. The chart below shows the current Dow chart overlaid on the 1980-82 Dow chart. 1980 was the US election year like now, and it was also a parallel secular commodities and solar maximum. A similar unfolding would see equities track sideways to upwards into the elections later this year, before down into their final low in 2014. I would note though that the solar maximum takes place after the elections this time, not before like back then. Turning to the current markets, Tiho did another great summary yesterday at his Shortsideoflong blog, and my thinking is very much aligned with that. I will just add that I continue to expect a bit more pro-risk upside into this weekend’s new moon, so that means today, but I expect to keep my bounce longs as the upside hasn’t been decisive. As my equities longs are fairly small, I would happily add lower if this turned out to be an extended B wave in an ABC down. Sunspots continue to increase. 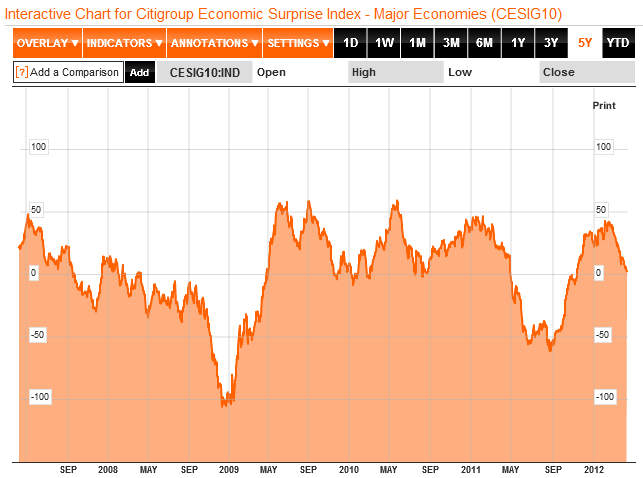 Economic Surprises continue to flounder. Asia continues to outperform currently. The first chart shows the Aussie dollar broke out of a falling wedge and successfully backtested, which previous marked new bullish uptrends in stocks and commodities. This second chart shows the Indian Sensex in a similarly bullish technical formation. 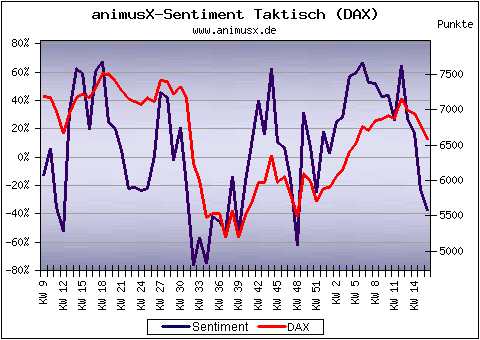 The third chart shows that Dax sentiment washed out fairly swiftly, echoing AAII sentiment for US indices, making upside appear more likely than down, from a contrarian perspective. 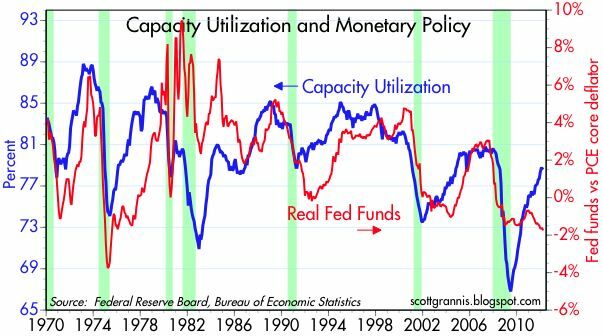 And the last chart shows capacity utilisation as a US economic proxy, revealing the Fed has kept rates too easy recently, making significant inflation ahead more likely. All four charts make pro-risk look attractive right now. Shorter term I am still looking for upside into the end of this week, and will then review whether or not to sell my bounce equity longs. There are more important earnings first, and I am aware the uptrend in place again since yesterday could yet be part of a longer B wave that began a week ago, in an ABC correction down. Alternatively, given how quickly capitulative breadth was reached, the low could already be in and a revist of the highs coming next. China GDP came in lower than expected but new lending much higher. 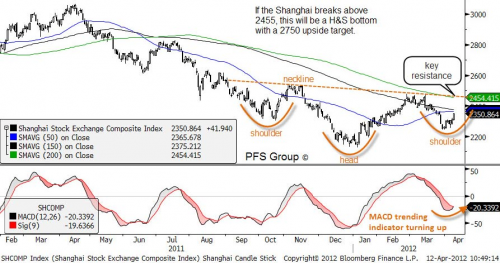 Ryan Puplava makes the case for the Chinese economy and stocks to be bottoming here. If so, that should provide a push on commodities. William Dudley of the NY Federal Reserve yesterday suggested they were ready to deploy QE3 if things deteriorated, which adds to the recent mixed messages but perhaps provided one reason for gold and the Euro to rally yesterday. 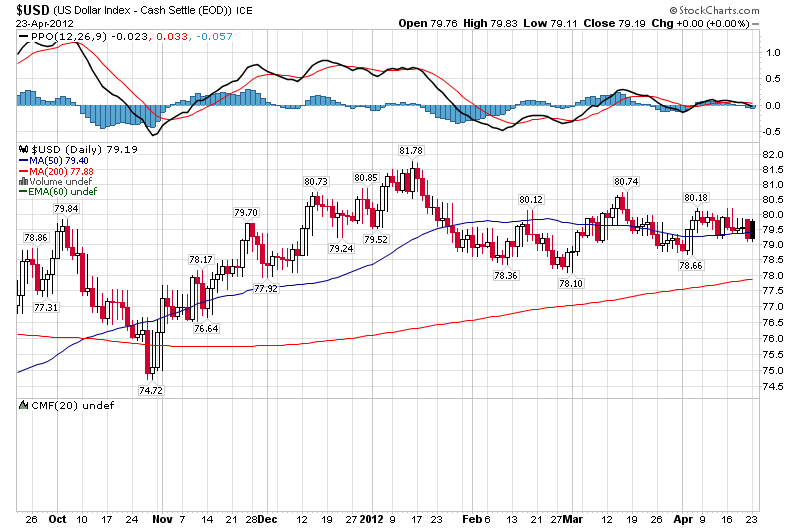 The US dollar index has accordingly dropped to the bottom of the triangle nose. Clearly, the triangle is running out of room. 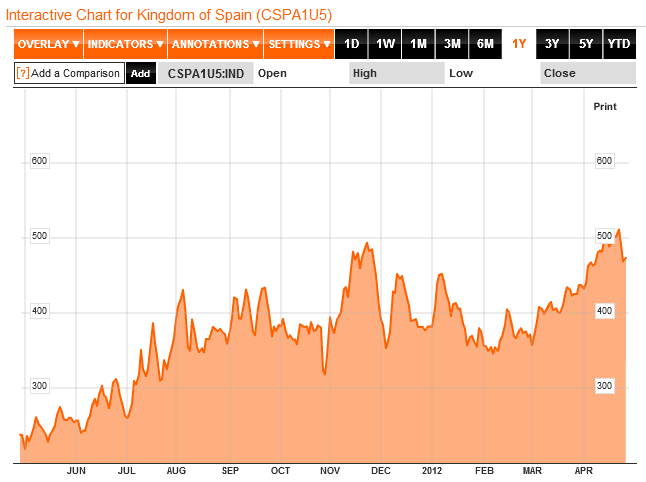 Spain CDSs remain critically high, though Italian debt sales yesterday went better than expected. US earnings are only just getting going, but Google last night beat expectations. US economic surprises made a leap up yesterday, but so did surprises for all the major economies. I remain of the expectation that the dollar will eventually break down, in a commodities finale, but in the shorter term I am not sure which way this will break. 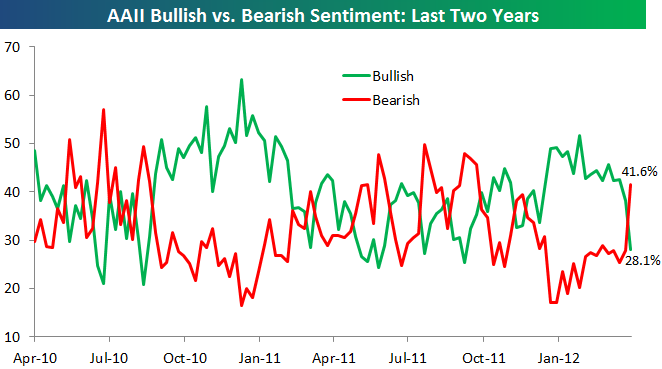 Sentiment still gives no clues either way. 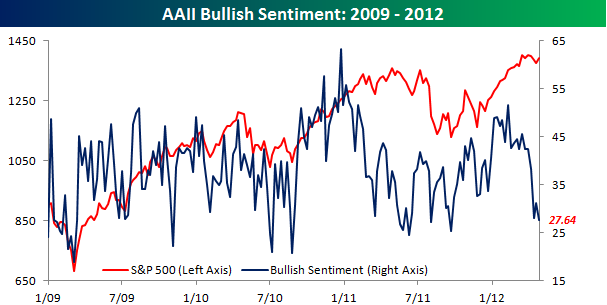 AAII bullish sentiment for stocks has collapsed, following the recent correction in equities. Positive pressure should resume into the end of next week and the new moon, following the passing of the geomagnetic storm. Yesterday a little pressure eased in Euro debt as there were supportive bond-buying noises from the ECB, but Spain CDSs remain critical. Crude oil inventories came in above average, but didn’t translate into downward pressure in the oil price. Capitualtive Breadth ended at 6 or 7 despite the upswing in stocks, suggesting equities should be underpinned and that a rally remains likely. 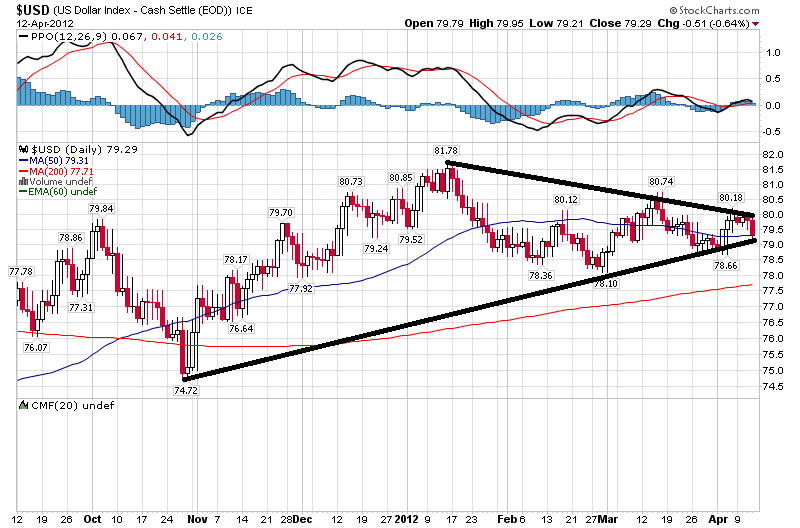 The US dollar index remains in its triangle for now. Will Preston has kindly shared his updated models with us again. These models are an amalgamation of political cycles, economic cycles and statistical cycles. 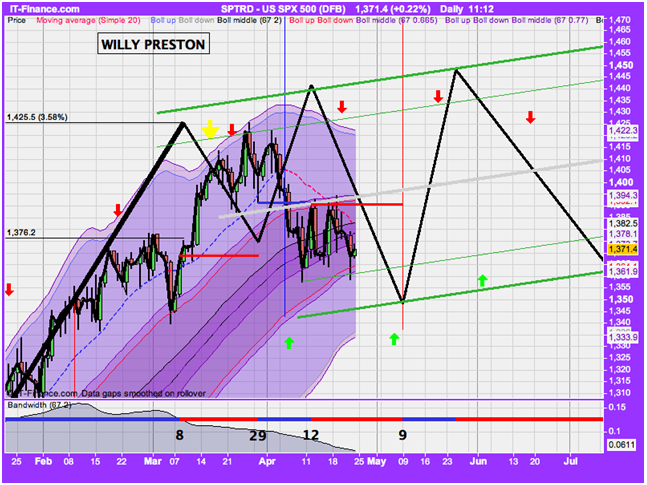 The first chart is the SP500, showing overall sideways volatility but with an upward bias into the summer. Tom McClellan’s Eurodollar 1 year advanced model predicts sideways consolidation into June, whilst geomagnetism seasonality predicts an upward bias into June. 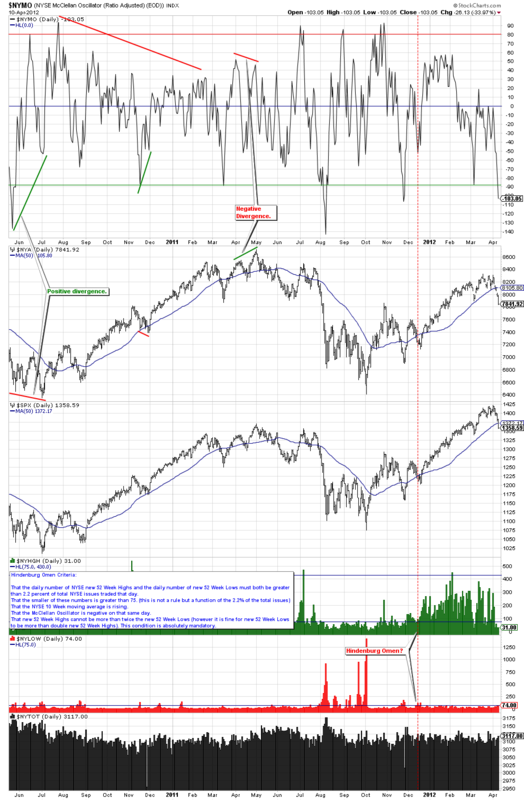 Jan Benestad’s 100 day momentum indicator suggests a higher high in around 2 months time. 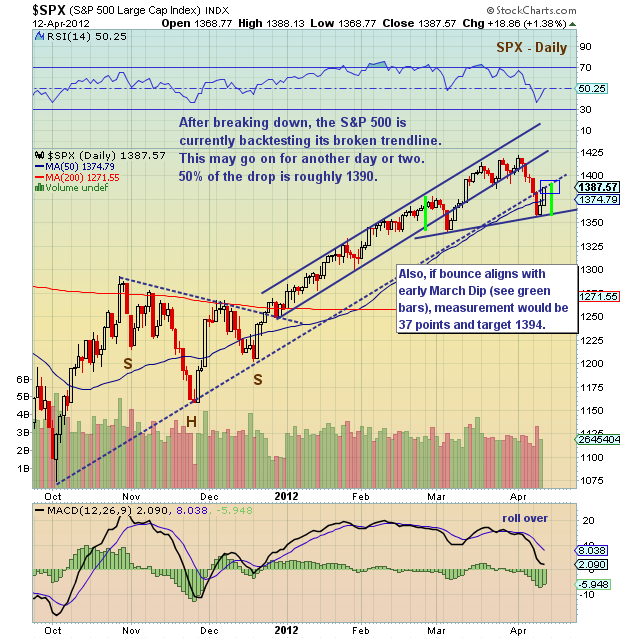 Stock market health remains pretty good, with no typical major top signals at the March top. Euro debt, China growth and Economic Surprises remain threats, but leading indicators and Operation Twist continuing into June remain supportive. Drawing all that together, sideways volatility with an upward bias for the next couple of months appears reasonable, unless there is a significant escalation in one of the listed threats or US earnings signifcantly disappoint. Next is Will’s gold model, which shows a steep upward bias from now into August, with a target of $2600 by early August. The inverse head and shoulders formation, which can be seen in that chart, has a target of $2050. With gold recently triggering overbearish and intermediate term buy signals, I consider there is a reasonable chance of that fulfilling. That would make for a new all time high, and would decisively end any doubt that gold’s bull was over. With that confirmation, and into clear air, gold could really become a momentum buy. 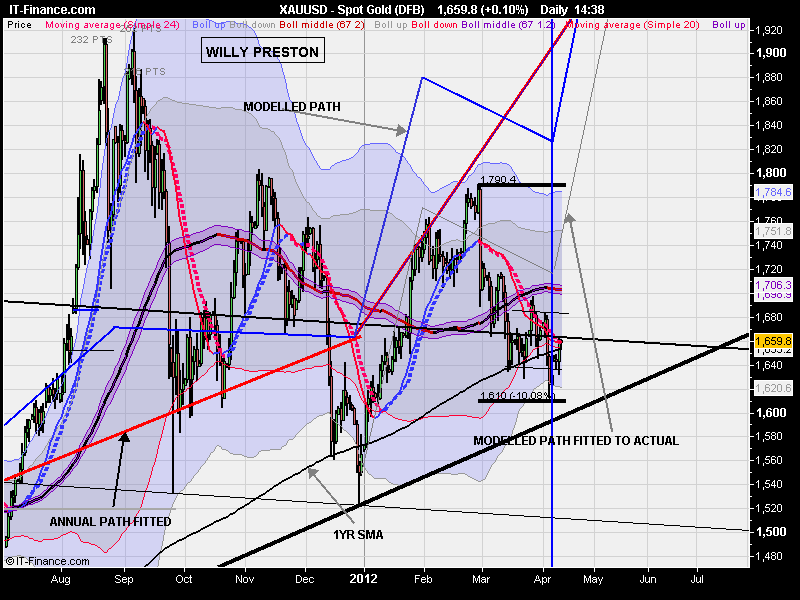 However, for now, we are a long way from that, with gold going nowhere in the middle of a 6-month sideways range. Sunspots have weakened again, but by planetary influence should pick up in May/June again. Increasing sunspots should encourage speculation in commodities and inflation. Got back from vacation last night, and my priority was to look for any glaring opportunities, covered below. I will catch up gradually on mails, comments, etc. I have updated the short term models page and will update the others in due course. 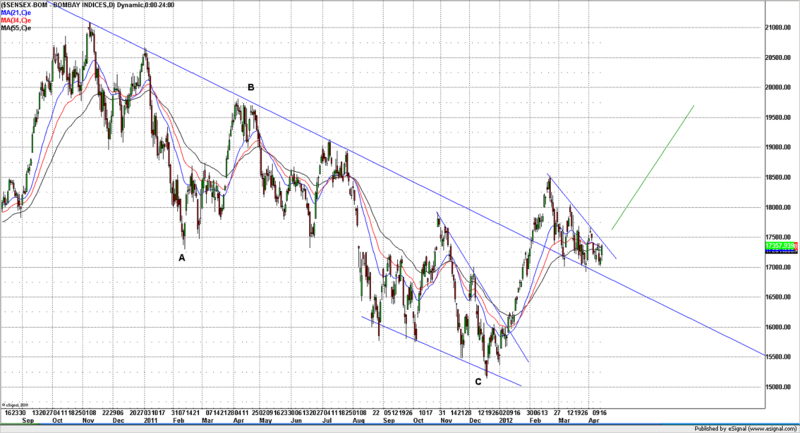 Below are models for the Dax and CRB which show potential upside from now into the end of next week. 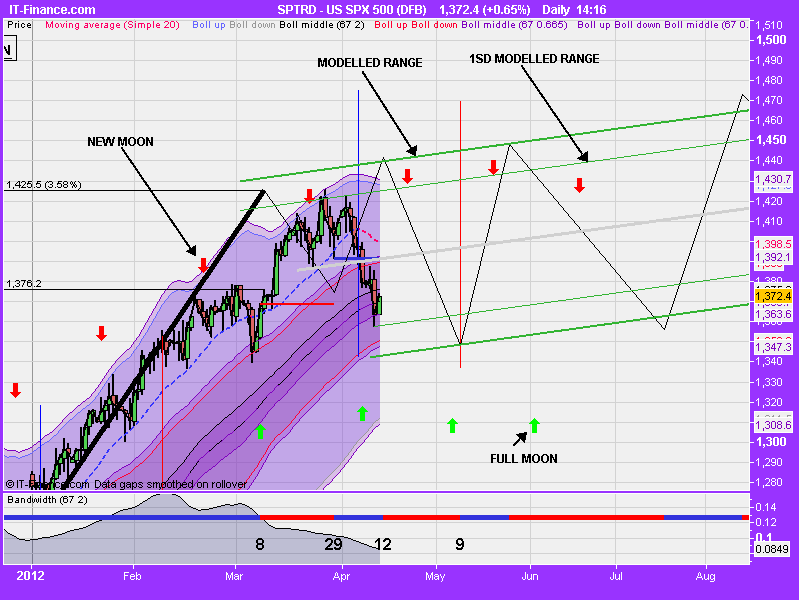 Stocks finally corrected then, and yet we now see a very oversold Nymo – below – which is a good signal for a bounce. Plus, Rob Hanna’s Capitulative Breadth indicator jumped to 6, where 7-10 historically implies capitulation and a market bottom of some kind. Together, they suggest the market won’t fall away here but will bounce soon, if not to a new high then to a partial retrace of the falls. I have therefore bought stock indices for a bounce. 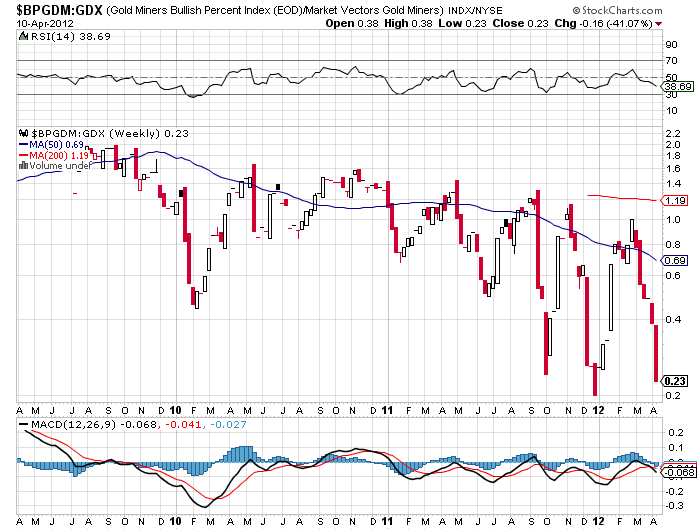 Gold and gold miners are the other opportunity I see. Here is gold miners bullish percent versus the gold miners ETF at a level which has historically been a great buy. 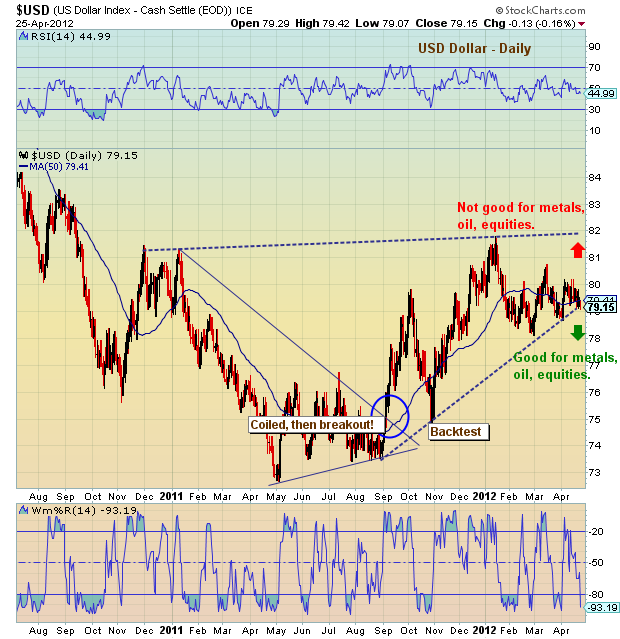 By various oversold/overbearish indicators, gold and gold miners look a buy opportunity here. Bernanke’s remarks whilst I was away that implied no QE3 caused another sell off in gold, but I believe that’s just part of the final clear out of weak hands. Gold does not need QE3 whilst negative real interest rates, central bank demand, money supply increases and real inflation data all remain supportive. Regarding ‘threats’: China slowdown, Euro debt re-escalation and Economic Surprises downward trend, there is some positive news on the former, but worsening on the latter two. 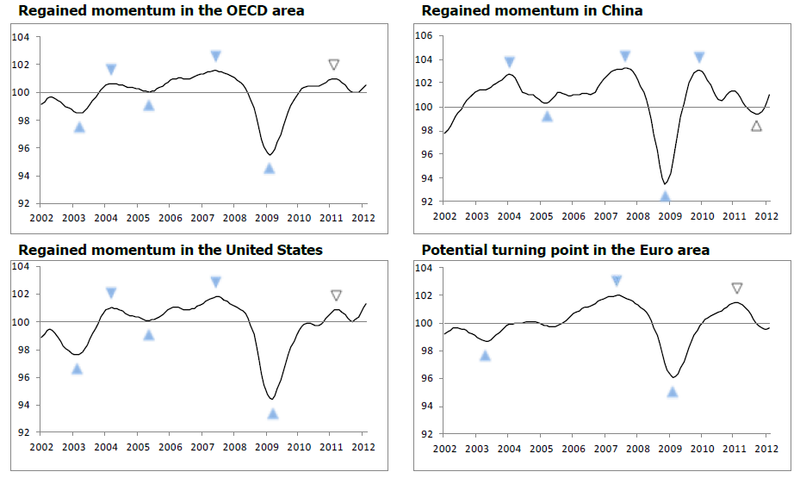 Here are the latest OECD leading indicators. 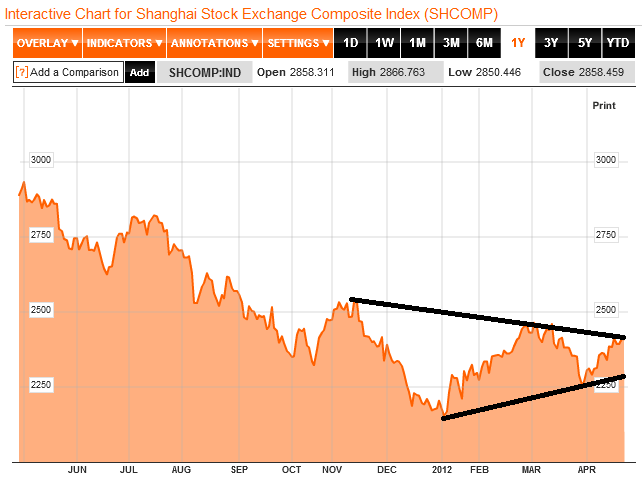 China has flipped to the positive since last month’s readings. ECRI’s leading indicators for the US also finally moved into the positive. Euro debt has flared again though, through Spain. 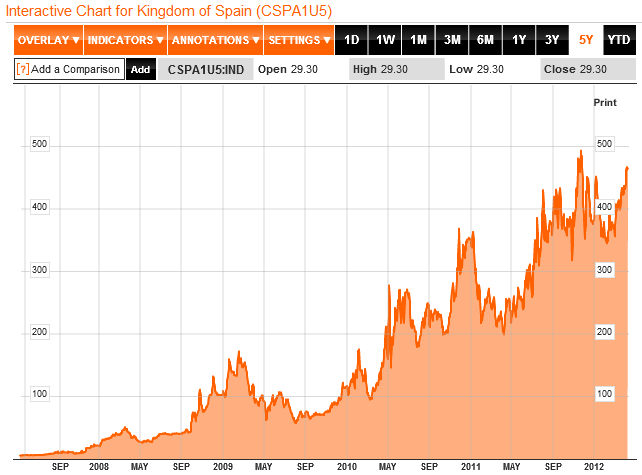 Here are Spain CDSs. 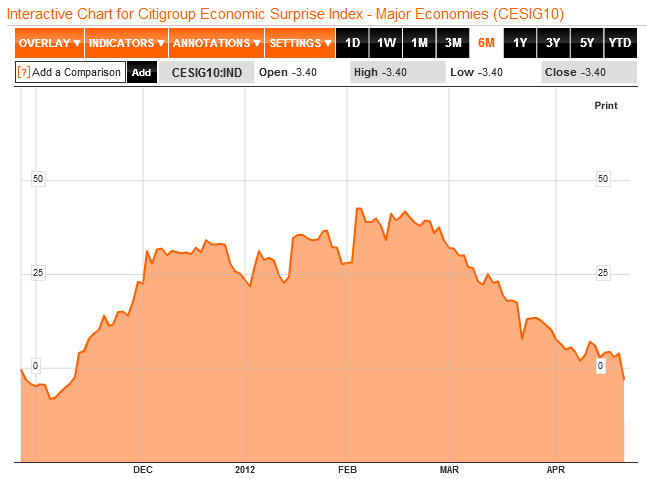 Italy CDSs are also trending up but not quite as critical as Spain. Here are Economic Surprises for the main global economies, which continue their downtrend but remain just positive. US Economic Surprises are similar. 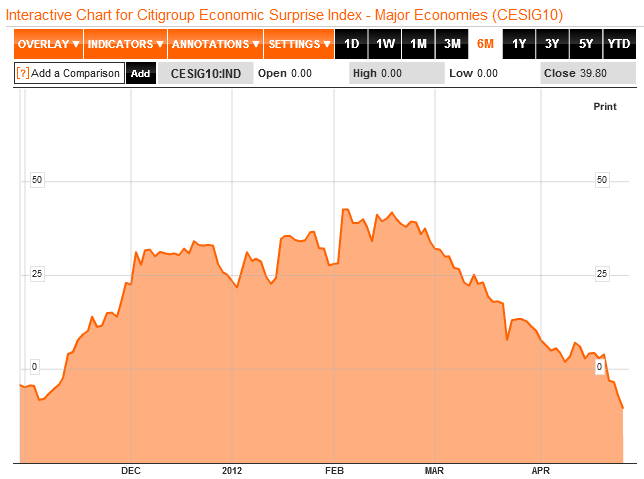 The situation in stocks, Euro debt and economic surprises shares some similarities with the first half of 2011. Then, stocks exited their strong uptrend in Feb 2011, as Surprises dropped and Euro debt came to the fore, but stocks traded overall sideways into July, with opportunities long and short. As we did not see major topping signals with our recent March 2012 top, I suggest we may be in for something similar, and the quick reaching of Nymo and CBI bounce signals supports this. My projected bounce window is into 21/22 April, so the end of next week. US earnings kicked off yesterday and will be influential on the markets, but we won’t get a feel for an earnings trend until next week.